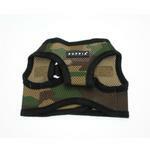 Harness your dog's happiness with this comfortable Camo Mesh Soft Harness Vest by Puppia. 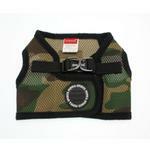 A dog harness is an essential item for your dog. This nicely designed dog harness provides ultimate support and comfort to your dog. Easy to get on and off step-in style with hook and loop closure on back. The breathable mesh design makes it a good warm weather choice.